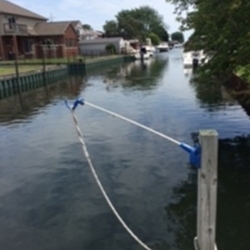 Keep your dock lines dry, out of the water, and safely off and away from dockside walkways. lines stay within safe and easy reach. Mounts on any rounded or flat surface. Swings 180 degrees side to side. arm is approximately 3 1/2 feet long. Fasteners included.